Hudba skupiny ABBA a Eltona Johna, která vás baví. is a band of four musicians, who were amazed by the music of the phenomenal band, which regularly occupied the top of the world music charts in the 70´s and 80´s. This performance can take your interest by the quality of voices of all musicians, but also thanks to their effort to get the audience involved in the show. We can proudly say, we have very young pair of singers ( Lucka - 18 yo, Markéta - 20 yo ), who are very fine looking and talented. They have a lot of experiences in many kinds of singing competitions, such as ( X-faktor, Československo má talent, Czechtalent, Popnota a další ... ). You can simply listen their quality at the left top corner of this page as audio sample. ABBA revival show lasts 70 – 90 minutes during which the most popular hits of this band are produced ( Dancing Queen , Super Trooper , Mamma Mia ... ) including the choreography. Songs were studied from the original video records of ABBA live concerts, which guarantees high quality of the performance and capturing the right mood of every produced song. After a year we performed in Brno Slatina 10.6.2015. The weather was wonderful and thank´s our fans, the atmosphere was outstanding from the beginning to the end of our show. As a special gift for the fans, we prepared a brend new collection of ABBA costumes. You can see some pictures in the photo gallery. 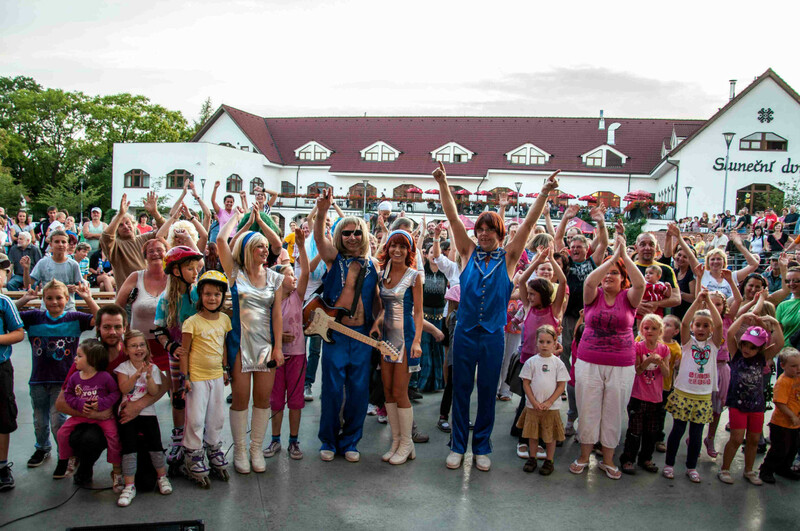 You can see here our new video from the all band ABBA tribute show in Přerov 23.6.2013. There are some pictures with fans from the best shows of our ABBA tribute band last year. RK AGENTURA , partner vaší zábavy.